On December 31, 2013, at 22:05 CET my visitor statistics for "blueprint news" registered the 50.000th visitor. Congratulations to him and a Happy New Year 2014 to all visitors. Russian widow of two husbands detonated herself at a train station. They killed her first husband in 2011 in a "fight for Jihad" and after him they [i.e. a militia] besieged the second [husband] and killed him. Two pictures of the resident [who detonated herself at a Volgograd train station]: With hijab after her conversion to Islam and earlier without. UPDATEs included on December 25 / 26 / 28. North Korea hopes for China's sympathy. 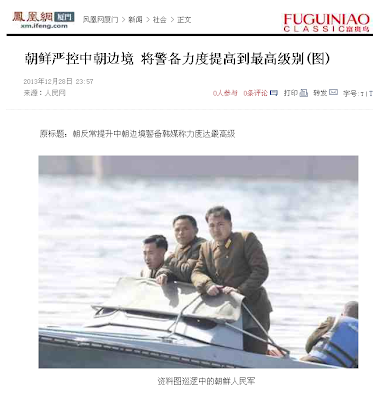 Kim Jong-un looking forward to visit China. 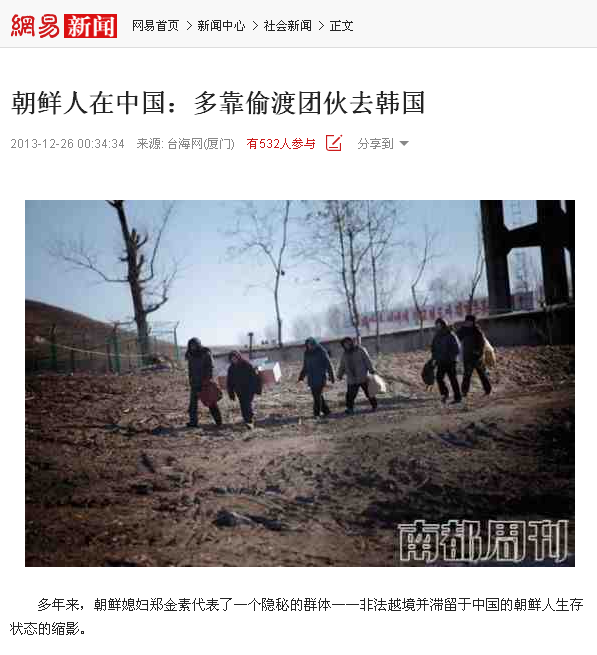 North Korean [citizens] in China: Many come up to secretly crossing to South Korea in [small] groups. Each year, young wives [.....] from North Korea represent some kind of secret colony [here], being detained in China's miniature of North Korean living conditions after illegally sneaking out of [their] country. [Archive] picture: N Korean People's Army on patrol. North Korea strictly controlling its frontier. Raising the garrison's dynamics to the highest level. After the execution of North Korea's "person No.2", Chang Sung-taek, South Korean media say North Korea is intensifying its border controls and even raising dynamics of the border region's garrison to the highest level. Patrols carried out at each weather and hidden missions have reduced to the highest extent the occurence of personnel illegally leaving the country. A 'Global Times' reporter at the Chinese - N Korean border found out that this winter North Korean border guards behave out of the normal. They unprecedentedly increased night patrols and the dynamics of defense controls.
" Mao ZeDong and Kim Il-song are friends, comrades-in-arms and comrades [of the Communist Party]. One might even say they are drinking companions. " The Central Committee of the Communist Party of China holds a commemorative symposium on the occasion of comrade Mao ZeDong's 120th birthday. 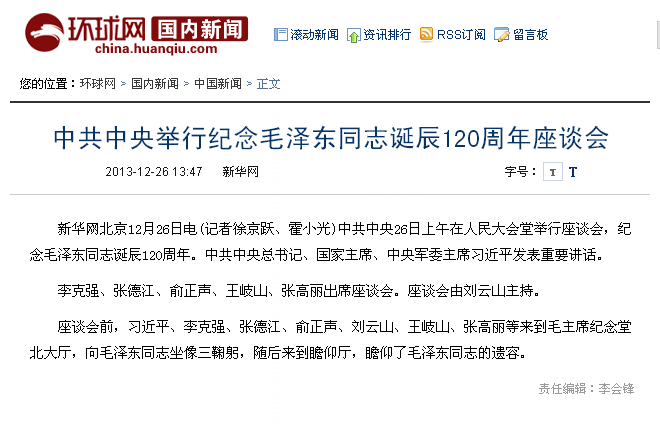 The Chinese article mentions the participation of China's leadership in that symposium taking place in Beijing's Great Hall of the People this morning. Attending the meeting are prime minister Li KeQiang, two members of the Communist politbureau, vice-premier Zhang DeJiang and Yu ZhengSheng, as well as two other high-ranking party members, Wang Qishan and Zhang GaoLi. Liu Yunshan, another member of the politbureau presides over the symposium. Before the meeting, the above mentioned politicians and president Xi JinPing visited the Chairman Mao Memorial Hall. 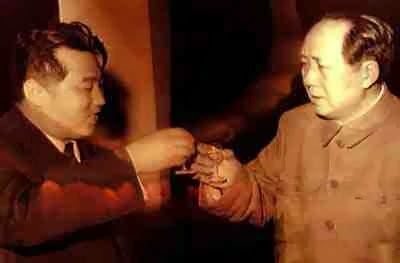 Mao meeting with Stalin's foreign minister Molotow. 85% of those being questioned consider Mao ZeDong's merits as far-reaching. The Chinese opinion poll is based on telephone calls and online requests made in great regions and cities on December 23 and 24, 2013. North Korea says it will attack the South without previous warning. In a telegram North Korea threatens the South [which is] hinting at its intention to conceal the real situation inside the country. The usual intention behind such provocation is to divert the attention of the outside world, thus leading the outside to overlook the real situation within North Korea. U.S. military leader Martin Dempsey only recently said, North Korea was probably going to start a military provocation. Hua ChunYing, spokeswoman for China's ministry of foreign affairs, said the Chinese side opposes any damage whatsoever done to peace stabilizing activity on the Korean peninsula, and hopes that all sides refrain from resorting to statements and actions that would cause a tense situation on the peninsula to [further] escalate. [China's president] Xi JinPing and Bolivia's president extend their mutual congratulations regarding the launch of a [Bolivian] communication satellite. The satellite was successfully launched on top of a Long March III rocket from the XiChang facility tonight at 0:42 local time. The satellite's perigee is at 210 km distance, its apogee at 42.165 km distance from Earth, and its actual angle of inclination is reported to be 24°. The procedure of roughly placing the satellite was finished 26 minutes after rocket launch. Plannings and construction for that satellite project, however, had taken 15 years at the Chinese development site. The satellite's orbit is now an elliptic one. In order to reach a circular geostationary orbit at a distance of 42.000 km from Earth, the satellite has still to perform some additional manoeuvres using its own engine. These manoeuvres might last some time. The angle of inclination mentioned above is the angle between the orbit plane and the Earth's equatorial plane. It should be reduced to 0° to ensure maximum performance of the satellite. 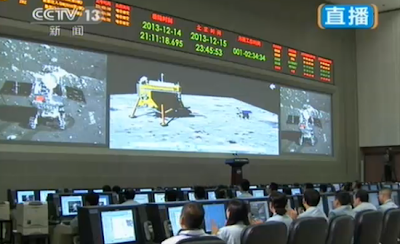 Third stage of [spaceship] "Chang'e" made a successful landing on the Moon. 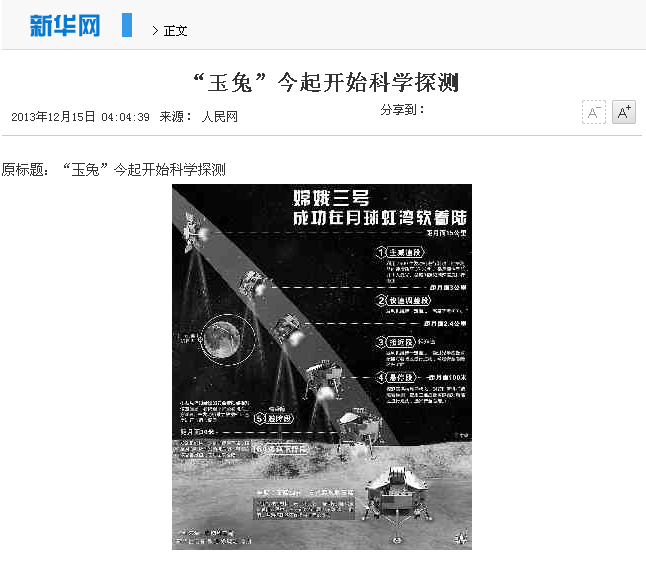 First time, China's [robot] explorer stepped on extra-terrestrial celestial body. China's landing device approaching the Moon. visiting the spaceflight control center in Beijing on Dec.15. Xi JinPing came to Beijing's spaceflight control center to watch with joy the photos that were mutually taken by both vehicles [i.e. the landing device and scouting robot]. sending back mutually taken photos. transmitted to mission control center, Beijing. N Korean Reader: "The Trial of a Traitor"
Starting in the "Main Road to Recovery" period of construction during the 1980ies, Chang Sung-taek began to acquire precious metal and simultaneously established a secret organization. Despising national law, he thoughtfully spent huge funds to buy precious metal. As a result, the nation's system of financial administration built up enormous chaos. Such he committed a crime against the country. 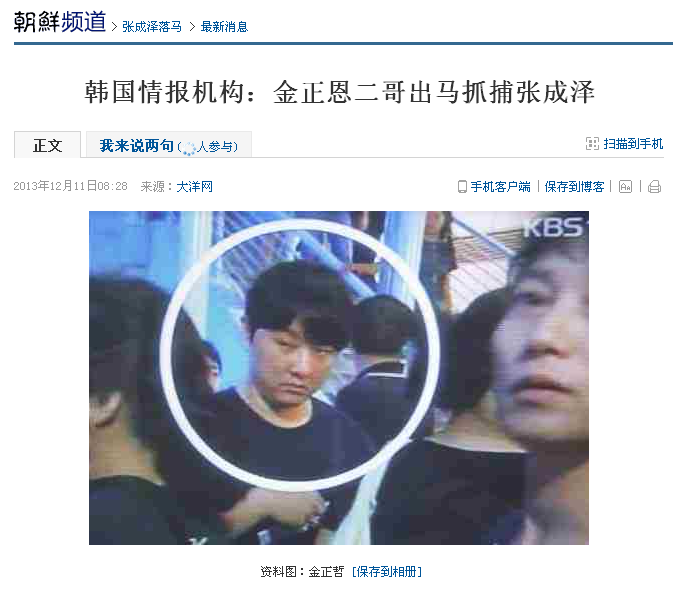 Since 2009, Chang Sung-taek spread all sorts of obscene photos towards his trusted lackeys. He brought along some capitalist mood of seeking pleasure and having a good time drifting into the country, everywhere spending without restraint and love of luxury. Only [to mention that] Chang Sung-taek in 2009, within one single year, seized and spent more than 4.6 million Euro from his small treasure, in relation with entering into an overseas gambling house. Proof enough what kind of [morally] degenerate person he is. Chang Sung-taek, obsessed by wild ambition towards political power, blind and reckless to such an extent that he foolishly considered, if he [only] mobilized the army, a coup d'état could succeed. Therefore, he wilfully attempted to stretch out his claws towards the People's Army. During the progress of law court interrogations, Chang Sung-taek thoroughly revealed that he harboured the evil intentions of an eternal traitor. He said: " I attempted to use the army and the people [to turn] against the current regime, [as] the condition of national economy and the people's living conditions sink into a difficult position, tieing their hands in a grievance without any plan [to get out]. " The target of a coup d'état [therefore] being exactly the " supreme leadership ". 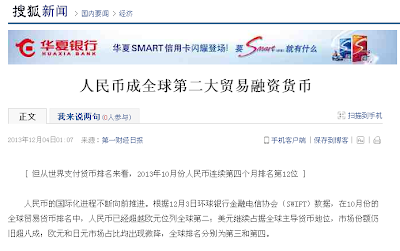 The Chinese text above is quoting an official report from KCNA [朝鲜中央通信社（朝鲜语：조선중앙통신사；英语：Korean Central News Agency），简称朝中社]. 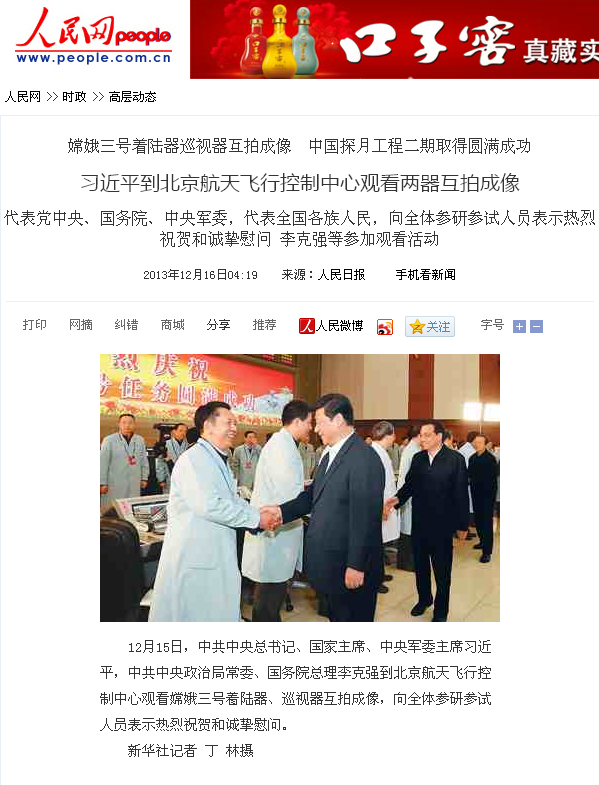 The Chinese source [中国新闻网] on which my translation is based did not add any editorial or semi-official Chinese comment whatsoever. In 2013, the news about North Korea have dominated the bandwidth of news reports provided by "blueprint news". It began in January, on the occasion of his new year's speech, that leader Kim Jong-un surprised us with an announcement of political changes related to Korea's national economy. A new leader trying new ways of ruling his country, one might have thought. Even the successful launch of a Unha 3 rocket carrying an earth-observation satellite could have been seen at that time as a defensive measure rather than another preparation for nuclear war using intercontinental missiles. Then, in February 2013, another nuclear test, even though not completely successful, brought Korea's nuclear subject back to our perception and on the agenda of a Japanese - U.S. summit. From there it took only some further weeks to North Korea's declaration that war on the peninsula "could not be avoided". It was at the end of March that North Korea actually declared the state of war between North and South Korea. Furthermore, the North threatened to close the Gaeseong industrial complex near the border to South Korea. That industrial zone was once established to improve economic cooperation between both countries and has granted the impoverished North access to $2 billion in trade per year. The industrial complex was really closed some time later, and in April 2013 the Korean peninsula found itself at the edge of war. During that month, "blueprint news" published 15 blogspots, all of them related to North Korea. However, the war declared by the North never became hot. Actually, it cooled off after some time, and business in the Gaesong industrial complex continued as usual. In June, a new development was triggered off when China didn't put forward again the "relationship of sworn brothers" but, instead, urged N Korea to give up its nuclear ambitions. Since then, Chinese - Korean relations seem to have cooled down, although neither Beijing nor Pyongyang have given official declarations about that. In December 2013, the "grey kingdom of ghosts", ruled by the Kim family, got its first cracks when one of its few accessible representatives, Chang Sung-taek, was sentenced to death. No wonder that U.S. foreign secretary John Kerry is quoted as saying that North Korea has become even more unstable, while latest news from Germany are indicating that North Korea has just called back its citizens from China where they are now engaged in business, probably as an answer to China's unspoken sympathies for Chang Sung-taek whom they came to know for many years as a partner in Chinese - Korean negotiations. It seems that Pyongyang's strict political isolation, in combination with military aggression at the edge of reason, is now going to take its toll. that was shadowing [China's aircraft carrier] Liaoning. 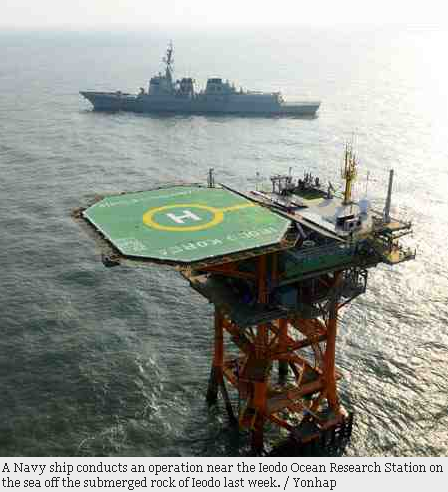 A report from December 5 is saying, U.S. navy ship "Cowpens" [i.e. CG-63], a cruiser belonging to the Ticonderoga-class, had the opportunity to keep watch on China's navy ship [the aircraft carrier] Liaoning in the maritime region of the South [China] Sea. When a Chinese ship for amphibious warfare "headed on to run up against" it, the U.S. ship applied emergency power to avoid mutual collision. The report is quoting as well an official from the U.S. State Department as saying the U.S. government has lodged a protest with China by means of diplomatic and military channels. December 14, 2013: Kim Jong-un inspecting the institute for military plannings and research. and who is interested in North Korea's missile tests. 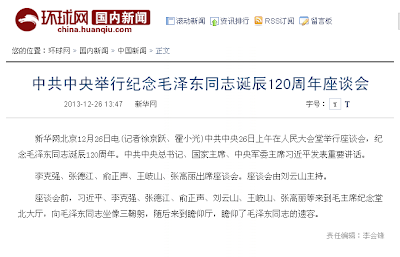 This morning, China's XINHUA agency and Chinese dailies report about the execution of former North Korean strongman Chang Sung-taek. to be the execution of Chang Sung-taek with a machine gun. North Korea's military tribunal sentenced to death Chang Sung-taek. North Korea sentenced to death Chang Sung-taek and executed [the death penalty] thereafter, saying he had admitted plannings for a coup d'état. When North Korea sentenced to death Chang Sung-taek, it stopped the execution of plannings for a coup d'état which he had [allegedly] admitted. 死刑立即被执行。 The death penalty was executed immediately. of the "Voice of America" VOA in nearby Washington DC. Important UPDATE added on December 11 ! North Korea announces the removal of Chang Sung-taek from all of his posts and from the Party. Looking back at Chang Sung-taek's activity before he was expelled from the Party. 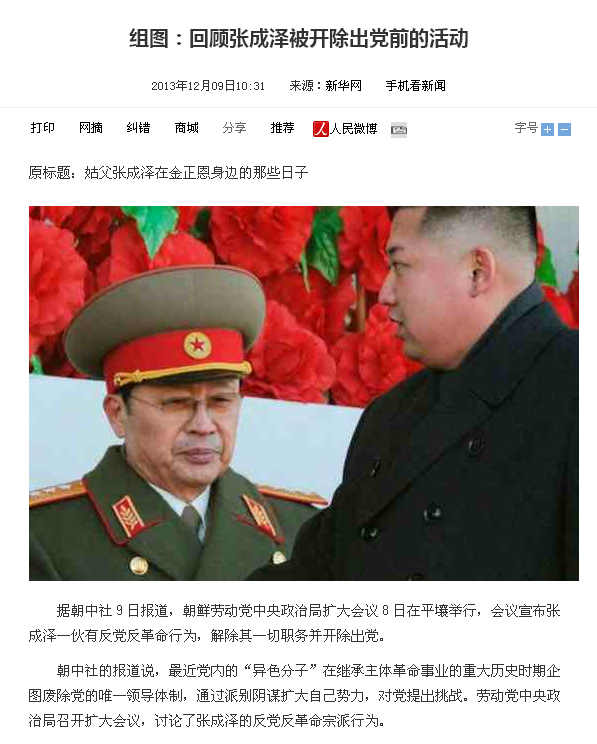 The Chinese article above is mentioning Chang's removal from office at the age of 67 because of "sectarian behaviour directed against the Party and the revolution". 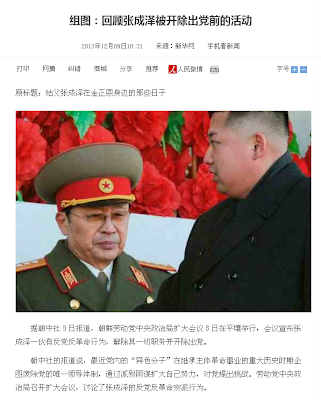 A series of pictures is showing Chang together with North Korea's supreme leader Kim Jong-un on different occasions. Recently some "differently colored element" within the Party, while carrying on the principal part in a great historical period [determined by] the revolutionary cause, attempted to abolish the Party's sole leading system, to extend his [personal] influence by means of factional conspiracy, and advance a challenge to battle against the Party. The Workers Party's central political bureau convened an enlarged meeting to discuss Chang Sung-taek's sectarian behaviour directed against the Party and the revolution. August 13, 2012: The vice-chairman of North Korea's defence commission, Chang Sung-taek, just arriving in Beijing to attend the joint Chinese-Korean conference for economic cooperation. 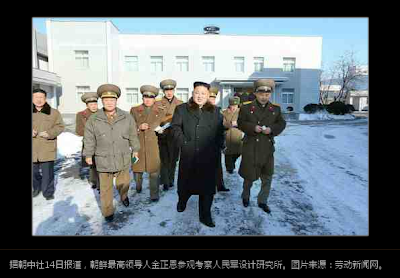 December 12, 2012, in Pyongyang / North Korea: Kim Jong-un and Chang Sung-taek (right side) inspecting the central command for satellite control. South Korea's intelligence apparatus: Kim Jong-un's second brother took up the matter to catch Chang Sung-taek. According to [Chin. name: Li YunJie], a representative of the South Korean center for strategic intelligence services [related to] North Korea, it is considered as a fact that one of Kim Jong-un's favourites Choe Ryong-hae, chief of the general political bureau for North Korea's People's Army, as well didn't dare to arrest Chang Sung-taek. The national ministry for public security was also unable to interfere in that matter. Finally, it was Kim Jong-un's second brother Kim Jong-chol to lead the command of the guard's squad of personal bodyguards to arrest Chang Sung-taek. Early this year in April, Japanese media [strongly proposed] that Kim Jong-chol had already risen to [his fully accepted] leadership of North Korea's secret organization "group of the beacon-fire" within the "Party of the crown prince". It looks as if Kim Jong-un has no real trustworthy man any longer at Pyongyang's highest level, as today's trusted follower could easily turn into tomorrow's enemy. He therefore needs his brother to appear personally to carry out the job of execution. In the frame of a regular press conference, granted by China's ministry of foreign affairs on Monday December 9, their spokesman said, China regarded the matter of Chang Sung-taek as an entirely internal affair of North Korea. covering islands disputed between China and South Korea. 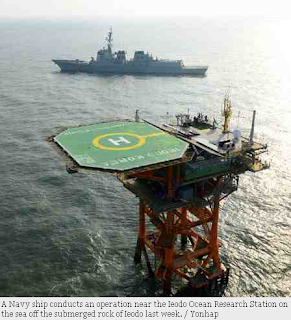 On [December] 8, South Korea's ministry of defence announced plans to extend Korea's air-defence identification zone (KADIZ). The regional limits are stretching to LiYu Island (or: SuYanJiao, Korean: Ieodo), MaLuo Island (Marado) and Hong Island (Hongdo) [belonging to] the South-Western part of the peninsula. All names of Korean islands are given in Chinese Pinyin and Korean romanization. English text and the position of LiYu Island / Su YanJiao (i.e. Su Reef) / Ieodo have been added to the above map for a better understanding of South Korean plannings. Actual currency information added ! When I recently heard about "bit coins", I had to learn how much that kind of electronic payment system has already become subject to speculation. Invented by some anonymous, a fact which doesn't provide much confidence in its value anyway, that so-called bit money should facilitate internet trade as some clearing unit for services provided. It seems that in some corners of the world with shaky economic conditions, such bit money should even have replaced the local currency to some extent. Now, it has come to the attention of China's Central Bank as a potential source of danger to regular currency systems. However, its significance as a virtual clearing unit is not generally disputed. It's all about standardization and control. The country is watching out at risks related to bit money. Yi XianRong: Continued gambling leads to [widespread social death]. Report from China News Network on December 6: This year the "insane growth" of bit money has [already] filled a basin of cold water in a "wolfish" manner. 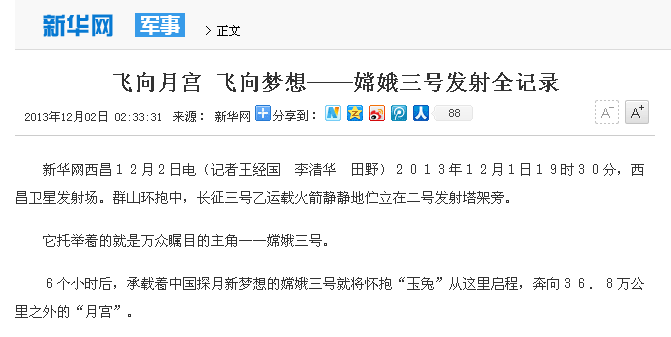 In the afternoon of December 5, five [members of the board] within the Central Bank [of China] jointly gave notice [that included] a warning of risks related to bit money. The news issued within the following hour said the price of bit money had dropped to an extent of 35%. Yi XianRong, a researcher at the [department] for financial research within the institute for social sciences, showed that bit money is a fictitious currency lacking [any] government's trustworthiness [or: credit] as a guarantee. It has no perspective for development and is just [like] foam existing as a fictitious currency, the only question then being whether this [=> fictitious currency] could erupt as well. [Its] noninterference with [=> economic] results based on development is therefore "stir-frying" [i.e. attracting] everybody. Personnel engaged in business [however] show, the [=> Central Bank's] notice doesn't say that bit money is not legitimate and must be abolished. To carry out supervision [and direction] then means to [introduce] standards along with guarding against money laundering and to avoid the fictitious currency lashing against the [=> regular] currency system. [China's] "Renminbi" has become the world's No.2 currency in trade spendings. The continued progress of international spending [based on China's] Renminbi [currency] is pushing forward. According to data [received] from the World Bank's financial newsletter association (SWIFT) and dating from December 3, the October ranking of global trade currencies showed that [China's] Renminbi has already surpassed the Euro ranking position as a global No.2 while the U.S. $ continues to hold the position of a globally leading currency. [Its] market portion still exceeds 80%. The Euro and the Yen market are holding an equal portion that appears to have dropped, [their] global ranking being No.3 and 4. Domestic bit money [produced] on an industrial chain. What's all behind that kind of pattern of pioneering work ? At the moment, the country's pioneering domain where domestic "bit money" is revolving around is mainly concentrated on [advanced] excavation of chips and mining [activity] along with bit money transaction platforms. The "KaoMao" (chin. : Roasted Cat) group in Shenzhen and the "Avalon" group in Beijing are mainly doing pioneering work in the chip domain. One pioneer of bit money chips [told] "Economic Survey Report", these two groups are mainly selling mining opportunity and chips. Each year, each company makes a profit of at least one hundred million [Renminbi]. 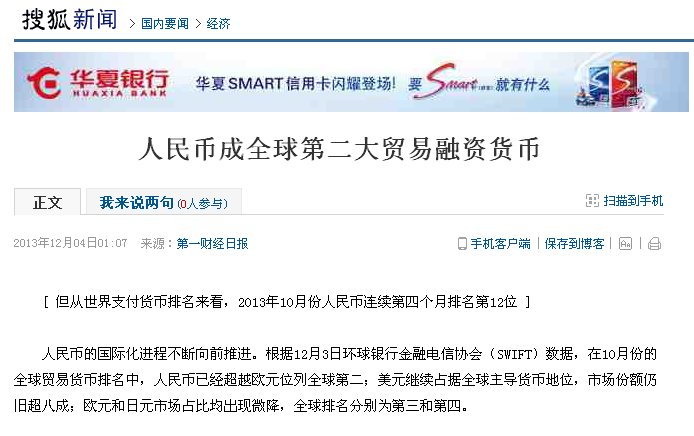 An earlier Chinese source is marking the begin of public interest in bit money and which is dating back to April 2013. The expression "bit money" is fitting with the Chinese word used for it. I therefore avoided the use of "bit coin" which is more common in Western countries. The expressions "gold mining" or "minig", used in the quoted Chinese article, are referring to the complicated process of an automatic generation of bit money and which has been designed to come to an end at 21 million "bit coins". The word "minig" is usually applied in the same context by Western sources. Another expression used by the Chinese author is the "bucket of gold" which should refer to the Western expression of "bit coin wallet" or simply "wallet", some kind of personal bit money account. Even though, it already missed the first four years period of "gold mining", bit money is entering the field of vision of China's masses depending on the large number of news reports from April this year. Most people say this should be a [new and strange] matter, but a small number of people [consider] to start pioneering work where one direction, however, is "mining" [activity]. The thought to get in touch with bit money without looking for ready-made "mining" opportunity, this is for many people [entering business] the first threshold to come across. Consequent "mining" activity returns a first "bucket of gold". What is different in computer trade: "Mining" [activity] is undergoing much change within half a year. It only accepts bookings that do not undertake to issue goods. Selling and buying is completely based on markets of absolute trustworthy sellers. Buyers' frenzy then returns a single buyer's "bucket of gold". Arafat's Death - Veiling the Facts ? Headline: Suspicion raised by French report on Arafat's death. Nasir al-Qadua, son of a sister [or: nephew] of the defunct Palestinian president Yasir Arafat, raised doubts on a French report that rejected the idea of his uncle's death from poisoning, [while] Israel said the results of that report are not surprising them. French scientists: Arafat died from an overall infection which should imply a natural death. According to the British broadcaster BBC, French media referring to insider information said a small group of French scientists, responsible for the identification of the cause of Arafat's death, have already decided that the former Palestinian leader's death should have been a "natural death" directly caused by an "infection affecting the whole body". An earlier report from Swiss scientists had pointed out that Arafat's body contained "a significant level" of the radioactive element Polonium. 1) There has already passed too much time [to determine a general infection]. 2) Arafat's body has already been "moved" many times before [which makes an infection even more difficult to prove]. What's all that fuzz about Arafat dying from some "general infection"? After Swiss scientists proved the existence of Polonium in Arafat's body, it must be clear that poisoning with a radioactive substance was at the origin of his death. Once the body being affected by such kind of poison, it is only a matter of time until immuno-deficiency and failure of essential organs would lead to the victim's death. Therefore, it is not the question what kind of infection or organ dysfunction finally caused Arafat's death but rather who applied the poison, a substance difficult to obtain and too expensive for any private person whoever that might be. Yitzhak Rabin, (born March 1, 1922, Jerusalem—died Nov. 4, 1995, Tel Aviv–Yafo, Israel), Israeli statesman and soldier who, as prime minister of Israel (1974–77, 1992–95), led his country toward peace with its Palestinian and Arab neighbours. He was chief of staff of Israel’s armed forces during the Six-Day War (June 1967). Along with Shimon Peres, his foreign minister, and Palestine Liberation Organization (PLO) chairman Yasir Arafat, Rabin received the Nobel Prize for Peace in 1994. As prime minister, Rabin put a freeze on new Israeli settlements in the occupied territories. His government undertook secret negotiations with the PLO that culminated in the Israel-PLO accords (September 1993), in which Israel recognized the PLO and agreed to gradually implement limited self-rule for Palestinians in the West Bank and Gaza Strip. In October 1994 Rabin and King Ḥussein of Jordan, after a series of secret meetings, signed a full peace treaty between their two countries. The territorial concessions aroused intense opposition among many Israelis, particularly settlers in the West Bank. While attending a peace rally in November 1995, Rabin was assassinated by a Jewish extremist. After the killing of a U.S. ambassador to Libya in a premeditated attack on the U.S. consulate in Benghazi and a single-sided U.S. operation to capture an alleged Al-Qaeda activist in Libya's capital of Tripolis, America now concentrates on supporting Libyan law enforcement rather than carry out own operations that have a potential quality to trigger off tensions between the Libyan government and U.S. authorities while Libya is still facing a chaotic situation with regard to its internal security. Headline: The FBI cares for the training of Libyan police officers. Headline: There will be training for methods to compile evidence in cases of crime and [how] to touch sites of crime. Libyan authorities in Tripolis signed a treaty with the United States about training of the Libyan police [with respect to] criminal investigation. In this context the Libyan minister of justice, Salaah al-Marghani, said that Libya needs that U.S. support in the field of building capacities for investigation [with respect to] cases of crime, especially as " Libya is regenerating itself after 42 years of dictatorial rule ". [Editor's note: "Chang'e" is the goddess of the moon in Chinese legend. 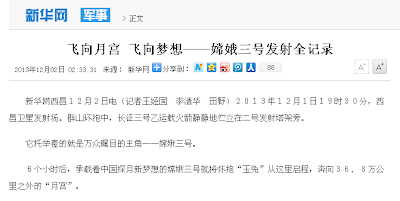 Xichang satellite launching facility on the first of December, 2013, at 19:30 [local time]. In the mountainous environment, a "Long March No.3 b" carrier rocket quietly reposed on its launching site. It should serve as a support to lift off Chang'e No.3, the main "actress" in the focus of millions of people. 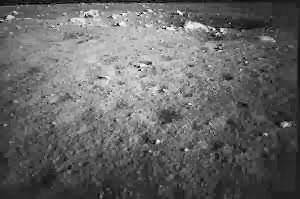 Six hours later, Chang'e No.3, bearing the weight of China's new dream of exploring the moon, the "Jade Hare", in her bosom, started on her journey and hurried to the "Moon Palace" which is 368.000 km away from here. "Jade Hare" will carry China's flag to the moon.